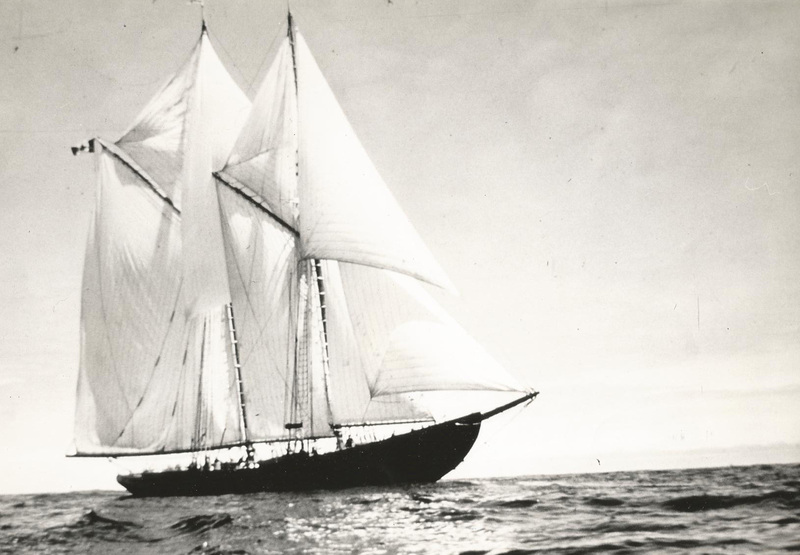 The 140-foot Canadian schooner, Bluenose, sank in shallow water off Haiti in 1946. A maritime celebration was held in September, 2013 at the UNESCO World Heritage town of Lunenburg, Nova Scotia, to honor a renowned vessel–the Bluenose II. The restored replica of the original schooner was launched amid cheers and applause. With smaller deck houses and more topside space, Bluenose II sails out of Lunenburg six months out of the year with a live-aboard crew of young Nova Scotian sailors. For the rest of the year, it joins other tall ships that visit Halifax and other ports throughout the world. But the old Bluenose wasn’t forgotten. Tales were told at the celebration about the 140-foot-long deep-sea fishing schooner that sank in shallow water off Isle aux Vache, Haiti, in 1946. Built in 1921, it was known as the “ship that was saved by a postage stamp” and later helped name a Canadian beer. Captained by Angus Walters, the two-masted vessel came off a successful fishing season in the same year she was built and won an international sailing race. It wasn’t unusual for fishing boats to race each other in the off-season and for 10 years Bluenose brought home many trophies. When it needed repairs, the Canadian government came to its rescue. Schooner Beer, named after the Bluenose had a label designed by artist Alan Ward of Ontario. His inspiration came from a postage stamp that featured the vessel, and memories of his grandfather talking about drinking schooners of beer in the early days. Proceeds from a government issued 50-cent commemorative stamp, depicting the schooner under full sail, helped save it from retirement. The captain and crew went on to win their last race in 1938, when schooners were being replaced by large diesel trawlers. Retired from competition in 1939, the Canadian provincial icon nicknamed, “Queen of the Seas,” continued to entertain tourists on excursions out of Halifax. Most visitors enjoyed the ship, particularly Alan Ward of Ontario, who often told friends about his pleasant days at sea. Idle at the docks from 1941 to 1942, the ship was sold to a Canadian freight company and island-hopped until 1946. That’s when she struck a reef and sank, too battered to salvage. In 1954, Oland Brewery commissioned an advertising agency where Alan Ward worked to design a label for their popular lager beer. Ward toyed with lots of names, but couldn’t find anything catchy. He was about to chuck the whole project when he spotted the 50-cent stamp of the Bluenose while sorting through a box of scrap paper. The picture renewed memories of the ship and stories his grandfather told him about drinking schooners of beer in the good old days. 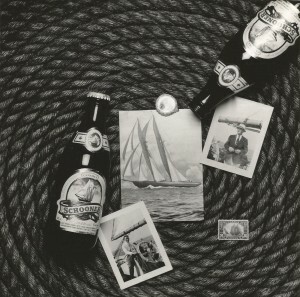 Thus Schooner Beer was born and in 1956 Ward won lots of praise as well as a reward for best design. Captain Walters died in 1968 at age 87, but lived long enough to sail aboard Bluenose II, a replica built in 1963 by the brewery. It was turned over to the Canadian government eight years later to sail as an ambassador of goodwill. Today, restored and radiant, it spreads benevolence and reflects the days when a ship launched a stamp and a beer. Even the title “blue nose” is very catchy, and all of it falls in line with your great writing style. Thanks for another GREAT article! Even the title, blue nose, gained my interest! Another GREAT article! Thanks so much for your kind words. Yes, the Bluenose has a sort of lure to it, and the fact that is “launched” a beer and a postage stamp makes it quite interesting……. in addition to the Bluenose being a beautiful sailing vessel. This story was very interesting. Has anyone ever discovered the original Bluenose sunk off the island of Haiti? The Bluenose foundered on a coral reef off Ile a Vache in 1946. This island is off the SW peninsula of Haiti near the town of Les Cayes. To the best of my knowledge, the remains have neve been discovered. It must have been wrecked badly since there were no plans to try and salvage it. I once ran across a story about a guy from my area going to look for it but it did not tell weather he found it or not. Incidentally, there was a guy who built a smaller version of the Bluenose for a private yacht back in the mid 80’s and sailed it all around the sound for a couple of years and then let it rot away in Steilacoom marina until about 2000 and then took it down to Oro bay and burned it. Thanks for your response. I didn’t know about the smaller version of the Bluenose. I haven’t heard from any divrs who have tried to salvage the Bluenose II. I think it would be pretty beat-up, battered and strewn about, but interesting to check out anyway.